The 2018 Kumbh Rashifal predicts that the planet Saturn/Shani would be in the house of Sagittarius for the Kumbh Rashi natives. This implies that there are a lot of activities to expect from these individuals. Keeping that in mind, there is a high likelihood that your house would be filled with friends and family in 2018. This is the year that you would be bonding with them in unique ways you never did before. From the look of things, Rashifal 2018 predictions could give you a tip of the iceberg on what comes to you the following year. This means that you are motivated to strive for the best in the coming year. Certainly, with such Varshik astrology forecasts coming to you on a silver platter, you should not hesitate but to find out more. The Kumbh 2018 Rasifal predicts that concerning your career prospects, this is the year you have been waiting for. There is a high probability that you might get the motivation you have been fighting for. Besides, there is a good chance that your incomes would increase as a result. That is not all, in 2018; Kumbha people, you would also find peace with the job you work in. You will find no reason to move searching for other jobs as the one you have will give you the satisfaction you strongly seek for. If you have been dreaming of starting up your own business, this is the right season for you. Luck is on your side and thus it is worth taking the leap. Concerning financial matters, Kumbh natives are expected to have a successful financial year in 2018. Bearing in mind that you would be mentally healthy all this time, there is a good chance you would make the best out of it. Your business would easily expand. This is one thing that you have been dreaming of doing over the past few years. Moreover, in terms of savings, the Kumbh 2018 Rasiphal predicts that you would be glad that you can save more in 2018 as compared to the previous years. Your world of love would not be as bad as you might have been thinking. Yes, the previous years might have been unlucky for the Kumbha Rasi. But in 2018, there are favorable chances that you could fall in love again. An interesting occurrence is that, those close to you will find every reason to commit. Nonetheless, you might be on the losing end if at all you fail to compromise. When love is ready for you; you ought to be patient and give your best shot. Socially, you would welcome new friends in your life. The good news is that some of these friends might transform into long lasting relationships to your advantage. Consequently, you should not disregard any friendship gestures that could come your way in 2018. Try this Kundali match test for marriage. The Kumbh natives would be happy with their health in 2018. During this season, you would experience the joy of achieving your health goals you had been planning for throughout the previous years. Your minds would also be sharp hence this would have a positive impact on your finances. 2018 Varshik Bhavishya Jyotisha astrology foretells that for Kumbh natives, 2018 would be a favorable year for them to travel. This is attributed to the good moods that you would be having the entire year. You could take trips with your friends and family to enjoy yourself. Alternatively, there is a probability that you would be taking several business trips to keep your business afloat. Kumbha natives or people who consider themselves to be born under the Aquarius sun sign expect the best in 2018. In love, there are people that they could fall in love once again. Their careers would also take a positive turn as they expect the best to unfold as the year progresses. 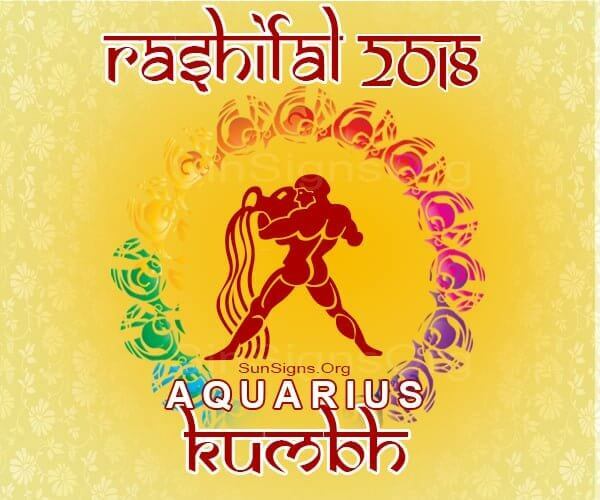 Kumbh 2018 Rashifal foretells that these individuals should be ready to make the best out of 2018.